It all started with a shower curtain, or really a lack thereof. Laura Evans was determined to brighten the dull bathroom in her new home after moving from Brooklyn to Asheville in 2013. Her search for a high-quality, modern shower curtain was fruitless, leaving her wondering why she couldn’t just make one herself. 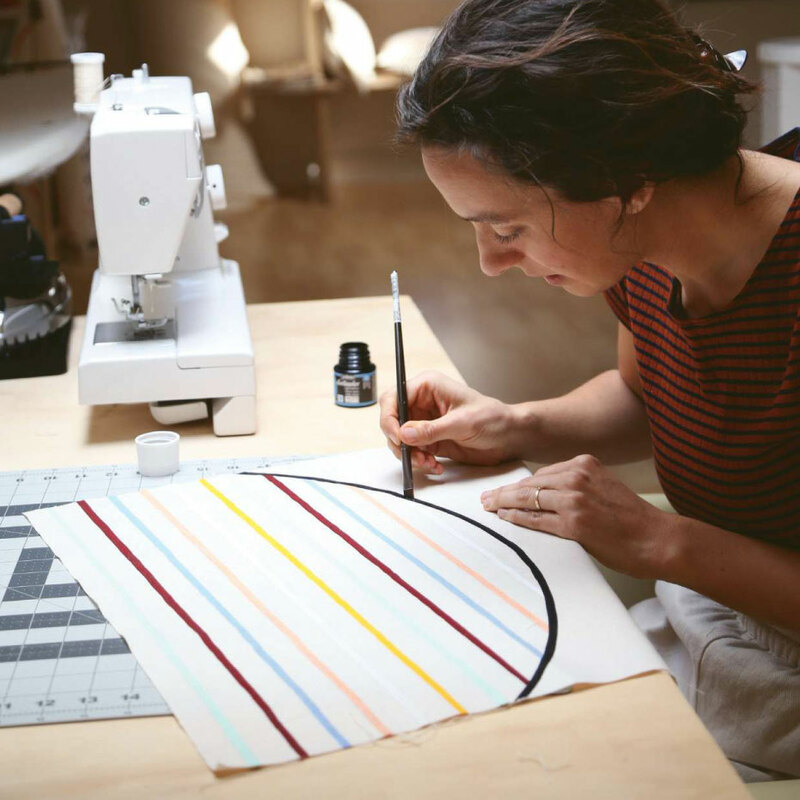 In short order, Evans founded OUTRA, a home textile studio that produces handmade pillow covers, pouches, and shower curtains adorned with vibrant geometric designs. Evans’ six years as a landscape designer for Brooklyn’s Prospect Park gave her a deep appreciation for clean lines and patterns. This simplicity on a grand scale was inspiring, but Evans craved vivid hues. “I love pairing up colors that seem fresh and different to me,” she says. Evans uses a nontoxic French fabric paint made by Pébéo that holds its color even after washing or hanging in the bathroom. For her shower curtains, she suggests using a liner, but otherwise her curtains are completely functional pieces of art designed for everyday use. Experimentation is at the heart of OUTRA’s approach. From the unconventional colors on the zippered pouches to the radiant curtains inspired by stained glass, Evans always strives to create something new. Evans brought her works to The Big Crafty in Asheville and Renegade Craft Fair in Chicago in 2015, but this year she is focusing on online sales. She wants to keep OUTRA a small, handmade studio with the potential to hire a few part-time employees. She can envision her patterns on other pieces of art like pottery or clothing someday, but for now she can be found transforming simple, functional items into dynamic pieces of art with every brushstroke. View and purchase OUTRA home textiles at www.outratextiles.com.